A replica of the seized Guokang brand extension cables and sockets. The Uganda National Bureau of Standards (UNBS) has intensified the campaign to seize all the substandard products in circulation. According to Barbara Kamusiime communications officer of UNBS the latest products to be seized by the agency’s monitoring team are Chinese Guokang brand of extension cables and portable cable sockets. She said the products were seized from Winning Star General Company Muziige Arcade, on Kikuubo Lane and stores on Plot 41 along Sir Apollo Kaggwa Road. “These extension cables were seized because they did not meet safety requirements in respect to absence of proactive shatters and fuse, requirements for protection against shock and earthling,” Kamasiime said. 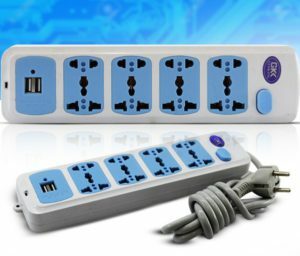 Kamusiime said similar samples of Guokang brand were earlier tested and failed to meet the standard for plugs and socket outlets for household and similar purposes. She said UNBS is in the process of prosecuting the trader and that the seized goods will be destroyed. “We call upon every trader to ensure that they deal in only products that meet the minimum standards because no substandard product will be accepted on the Ugandan market whether locally manufactured or imported,” she added. UNBS quality assurance manager Martin Imalingat said ensuring quality products is essential for manufacturers to provide quality goods and services which enables them win market for their products. “We currently have over 2,000 standards in the country and we are doing all we can to ensure that there is awareness and sensitization about them by simplifying the technical documents so that they are understood by all the relevant stakeholders,” he said..
Imalingat added that new innovations, change in technology and consumer tests drive standards and urges those who already comply with standards not relax but to be innovative and prepared to change since standards also keep changing. He said UNBS will make sure no non-certified product is put on the market, whether locally manufactured or imported, and no government agency will be allowed to buy such products.